A person has been arrested in the case of alleged molestation of a girl in Handwada. After this incident the violence is continue from a week in North Kashmir. According to the information Jammu & Kashmir Police has arrested Hilal Ahmad Banday, one of two accused, in Handwara last night. The Police said that the accused is being questioned. The girl(16) denied those allegations of the locals that an army man had outraged her modesty. 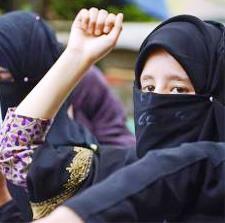 she, in her statement, said before judicial magistrate when she was returning after school with her girl friend, she used the public toilet near main Chowk situated at Handwara where two boys tried to outrage her modesty forcefully and her bag was snatched among whom one boy was in school uniform. .Hilal whom has been charged by the girl for the alleged molestation before the Chief Judicial Magistrate (CJM) is one of the two accused. Hilal has been alleged that when the girl was coming out of the public toilet at Handwara city, he intercepted to molest the girl at that time on 12th April. The 5 person were killed during last week in the violent protests spread in the cities, Handwara and Kupwara. The relaxation in curfew for 3 hours ended peacefully, and again clamped in the wake of turmoil in the cities.